Interim Communications Director Bill Lobdell just sent out the following Press Release announcing yet another basket of awards for Costa Mesa Television - CMTV 24. Kudos to Dane Bora and Brad Long for their continuing excellence and outstanding service to our community. COSTA MESA, CALIF.—Costa Mesa Television Channel 24 (CMTV 24) earned three top place awards this week at the 15th Annual STAR Awards presented by the California and Nevada chapter of the National Assn. of Telecommunications Officers and Advisors. “City Talk” received the first place Talk Show STAR Award for the fourth time in the past five years. “The Community Report” was recognized as the best magazine show for the second time, and CMTV 24 was honored for the third time for overall excellence. The City-run television channel has now received 13 first place STAR Awards since 1997, including 10 in the past six years. Additionally, CMTV 24 has earned numerous second and third place honors in a variety of categories over the years. The STAR Awards recognize excellence in government programming by facilities serving California and Nevada communities. Entries are judged on the basis of creativity in achieving stated objectives, technical proficiency and diversity of programming. Way to go. A positive look at Costa mesa. I watched the Lyon Museum show and the train show. These guys do a great job. Keep up the good work. Something Costamesaians can be proud off. Well deserved rewards for talented and hard-working (I know from experience) people. In the current extremist culture, I suppose that makes them prime candidates for the layoff list. After all, the city supposedly can't afford to pay quality wages for quality work. Maybe city hall can outsource Telecomm to a fly-by-night with undocumented workers. Or even drop the capability altogether. I mean, really, how much does T/C contribute to Righeimer's bottom line? He's willing, even eager, to shrink the city's near-term quality of service, so it's likely he cares even less about long term quality of city service. 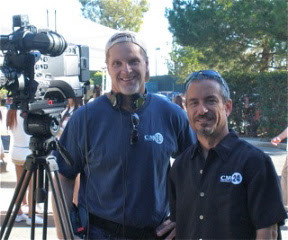 Dane and Brad contribute greatly to both short-term and long-term quality of life in Costa Mesa. If only they could produce revenue as well. Oh well, it's been good to know you, Dane and Brad. I'm sure your next city will be delighted to acquire your talents.